Whether you are a member of the community, considering moving to our district, or just simply surfing the web, it is our desire that you find this site enjoyable and filled with valuable information. Building on the foundational principle that every student can learn, the professional staff at Venice is dedicated to meeting the academic needs of all learners. Achievement and success are our motivators as we strive to meet our district’s academic goals. The Venice Team would like to extend a personal invitation to each parent to become an active participant in his/her child’s educational experience. We believe that parents, family, and community members are a vital part of the educational process. We encourage all adults to stress the importance attending school daily and of setting high standards for education. Be sure to meet our faculty and staff and review a listing of our upcoming programs and events in the calendar section. 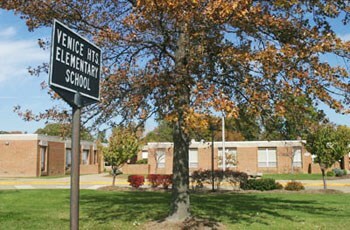 We hope you find this web page beneficial to learning more about Venice Heights Elementary School. Services: Individual/Group Consultation with Parents/Coordinate services with outside agencies.